"One of the benefits of Uber is that for people who are displaced temporarily ... Uber is there"
This Sept. 6, 2018, file photo shows Uber CEO Dara Khosrowshahi speak during TechCrunch Disrupt SF 2018 at Moscone Center in San Francisco. Furloughed federal workers are turning to Uber during the shutdown for bridge income, Uber CEO Dara Khosrowshahi said Wednesday. 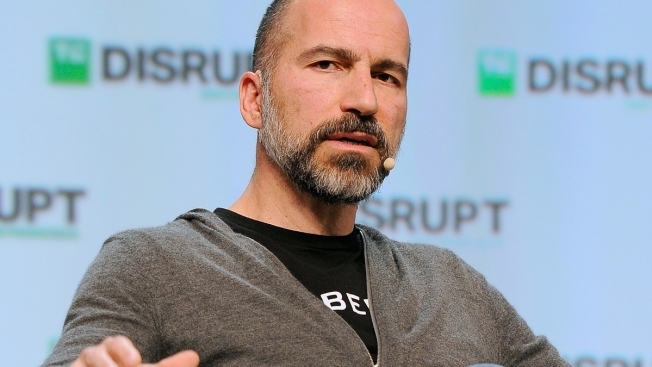 "We love it when new driver partners join the platform, but this is most definitely not how we want new driver partners to join the platform," Khosrowshahi told CNBC's "Squawk Box" from the World Economic Forum in Davos. "We haven't quantified [how many new drivers have joined], but it's definitely happening in D.C., and it's happening to the most needy. We're hoping that this ends." Washington D.C. is now in its 33rd day of a government shutdown. More than 800,000 federal workers are going without paychecks and facing mounding financial pressure. Temporary work as an Uber driver comes with a relatively low barrier to entry, Khosrowshahi said. Anyone with a car, a license and a clean criminal record can download the app and get started. Uber Freight is already lowering trucking costs after just 20 months of operation, says head of division from CNBC. "One of the benefits of Uber is that for people who are displaced temporarily — if they lose their job, if something happens and they need some earnings opportunities — Uber is there. And then when they don't need Uber, they can kind of move on," he said.